Corey Cerovsek was in Milwaukee for the weekend of January 8. He was scheduled to perform with the Milwaukee Symphony, but due to the musicians’ strike, this did not come to pass. He spent Saturday morning at UWM with String Academy students giving a master class. Shemida Anderson, Adam Diderrich, Emily Greene, Katie Gorsuch and Eliza Hamner played for him. Corey offered many excellent suggestions. 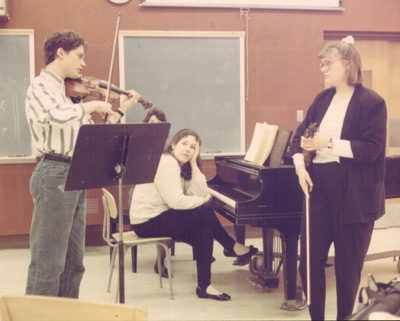 All who watched the class came away knowing that they were privileged to have spent the morning with not only a virtuoso violinist, but also with a warm and generous person with a self-effacing sense of humor. What a treat for all.